It isn't too hard to tell that this bird is a duck, and judging from the dark overall color, lack of barring or streaking in the plumage, and large bill a scoter. The white spots on the face and the lack of any color in the bill indicate that this individual is a female or young male. A Black Scoter would have an extensively pale face, a smoothly rounded head, and a smaller bill. Our candidate has small white spots on an otherwise dark face, an angular head, and a truly massive bill. The main identification contenders then are White-winged and Surf Scoters. The white secondaries of a White-winged Scoter are diagnostic for that species vis à vis Surf Scoter but are sometimes hidden. If a white wing patch can't be seen we need to look at the pattern of feathering on the bill. On White-winged Scoter the feathering extends well out onto the bill, while on Surf Scoter the feathering stops abruptly at the base of the bill. We can see on our candidate that the feathering stops abruptly at the bill base, making this bird a Surf Scoter. 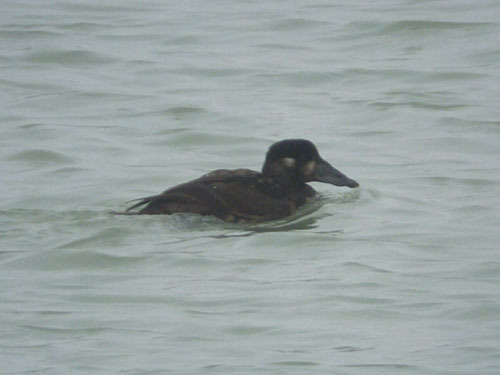 This Surf Scoter was photographed on December 6, 2008 at North Point Marina in Lake County, Illinois.